The Super Bowl broadcast by NBC on Sunday was watched by 111.3 million people, according to Nielsen estimates, making it the most-watched program in television history for the third year in a row. Approximately 47.8 percent of U.S. homes tuned in for the New York Giants come-from-behind 21-17 victory over the New England Patriots, off a tenth of a percentage point from last year's Super Bowl, which earned a 47.9 for Fox and drew a then-record 111 million viewers. 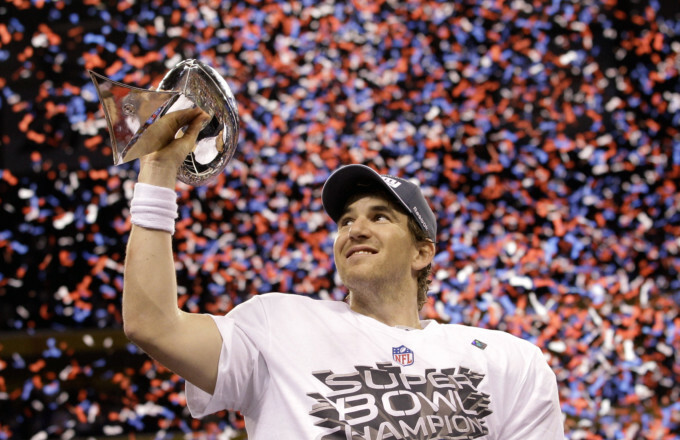 Sunday's Super Bowl peaked between 9:30 p.m. and 9:58 p.m. ET, according to Nielsen, when 117.7 million viewers watched Giants quarterback Eli Manning engineer a game-winning fourth-quarter drive--and Patriots QB Tom Brady fail to lead one of his own. The halftime show, featuring an age-defying performance from Madonna, drew 114 million viewers--the most-watched Super Bowl halftime performance in history. Sunday's game also set a record in Boston, which registered the best overnight rating for an NFL game with 56.7 percent of homes in the metro market tuned in. The game also set a Twitter record for sporting events, with a barrage of 12,233 tweets per second registered during the final minutes, according to Twitter. It was the most tweets per second for any English-language event in Twitter history, and nearly triple the frequency of last year's game, which saw a then-record 4,064. Ratings for the eighth annual Puppy Bowl, Animal Planet's furry fit of Super Bowl counterprogramming, are due later Monday.